Vascular surgery as a subspecialty in medicine is actually a fairly new field. While not new enough to be experimental or dangerous, the idea of minimally-invasive procedures to treat vascular diseases goes back less than fifty years. Like other areas of surgery, innovative techniques and methods are constantly being introduced to vascular surgery. The field is a clear example of the strides medical care is still taking. 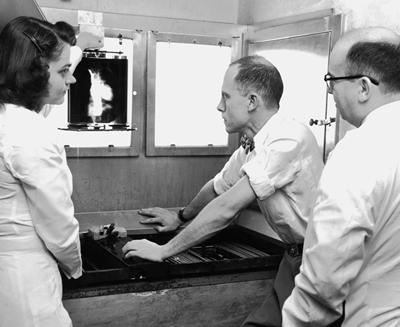 Charles Theodore Dotter, known as the “Father of Interventional Radiology”, was a US pioneer in angioplasty. The minimally invasive, endovascular procedure widens narrowed or obstructed arteries or veins. A deflated balloon is attached to a catheter and put in place using a guide wire, then inflated to increase blood flow. A stent may be inserted then the balloon is deflated and removed. Dotter used this method in 1964 to treat a woman suffering from a painful leg ischemia and gangrene. The 82 year old patient refused to have her leg amputated, which beyond angioplasty treatment was the only option to save her life. The treatment he provided gave circulation back to the patient’s leg, which remained open until her death a couple years later. Dotter also developed liver biopsy through the jugular vein in 1973. Enough time and new developments have placed vascular surgery in a category of it’s own; vascular surgeons typically confine their work to just vascular, while general surgeons defer endovascular cases to vascular surgeons. The specialty and separation of the fields means greater development and attention to detail is paid to complicated and unique endovascular cases. In addition to treatment, detailed knowledge of a patient’s vascular health can serve as valuable preventative care. The discoveries of how our body’s vascular system interacts with our body as a whole has led to many new methods of treatment. Vascular Surgery Associates implements modern technology and methods to diagnose and treat patients. Like the field it specializes in, VSA is at the forefront of medical care.